French in origin, the term refers to speciality meat products or at times is loosely applied to delicatessens that are considered as providers of specialty meats. When the term is used to describe a deli, the appropriate word for the store that sells Charcuterie is Charcutier. Charcuterie is most often used as a term to describe the products within the deli, such as the sausages, the hams and the various specialty foods made from these meats of pork. As an example, a "Charcuterie Platter" may be a food tray with a variety of hand-made sausages, pâtés, artisan breads, and wine. However, other foods that may be included that are more focused on meats could be, rilletes (shredded pork), galantines (cold rolled pork stuffed with ingredients), pork pâté (ground pork meat formed into a mold), pork forcemeats, meat pies, seasoned proscuitto, andouille sausage, blood sausages,and garlic flavored hard salami. These are a few of the rich foods that may be arranged as a Chacuterie Platter. It is not uncommon to include other meats in addition to pork. 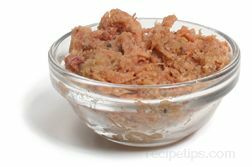 As an example, there may also be foods made with game such as duck, goose and rabbit terrines, or meats that may include veal. Within a Charcutier (deli) it is typical to see additional food products for sale that could include varieties of cheese, breads and wine but the main products making up the Charcuterie in each store are typically all related to meat products and more specifically to pork.